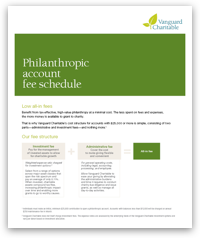 At Vanguard Charitable, we offer philanthropic accounts to help individuals fulfill charitable missions that reflect the people and causes they care about most. Together we support thousands of nonprofit organizations every year. We make it easier to manage charitable donations by alleviating the administrative burdens and time it requires to invest assets, conduct charity due diligence, and issue grants. Donor-advised funds reduce work and streamline costs on your end without sacrificing charitable impact--in four simple steps. The unique structure of a donor-advised fund allows you to be strategic about giving and manage your charitable donations in a tax-effective, flexible, and convenient way. Outside the immediate benefits, such as a charitable tax deduction, our philanthropic accounts also offer your charitable contributions the opportunity to grow tax-free through a variety of investment options that span the risk spectrum. Discover how our investments help you give more through a donor-advised fund. 1Select account status is subject to Vanguard Charitable's approval and is based on account balance, activity, and patterns. Most accounts with balances of more than $1 million for at least three months are approved for Select status. Account status is reviewed and approved on a quarterly basis. 2Vanguard Charitable does not itself charge investment fees. The expense ratios are assessed by the underlying funds of the Vanguard Charitable investment options and vary per donor based on investment allocation. Weighted average expense ratio as of December 31, 2018. 3On certain occasions, we may assess additional fees on individual philanthropic accounts to cover special costs. These may include legal and professional costs, taxes, or transaction costs. When possible, fees will be communicated before being assessed. Find out more information about fees in our Policies and guidelines booklet.